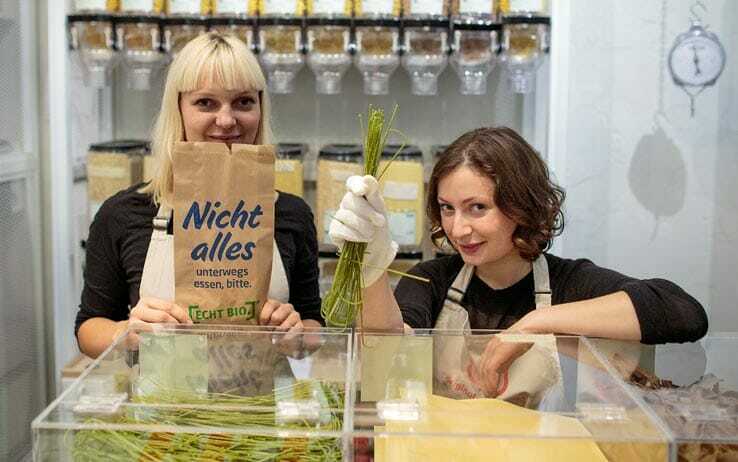 An important step toward “clean” shopping: two women from Berlin open the first supermarket without packaging, proving that it is possible to rethink the way we shop. The concept of short distribution chain and free-waste products has lately been spreading among some small organic shop shelves; even some chain of big stores has decided to organise sections with unpackaged items. Nonetheless there are still very few shops completely free of packaging and even less are selling unpacked items. In one of the most popular Berlin districts, Kreuzberg, the first real sustainable supermarket opened on 13 September 2014 selling only packaging-free products: it is Original Unverpackt. Thanks to the crowdfunding campaign previously organized to boost the project, Sara Wolf and Milena Glimbovski could pour 115.000 euros into the idea they had been dreaming about since 2012. The aim is to facilitate a long term “clean” shopping; in fact statistics say that Germany produces 16 million tonnes of waste every year. The situation is even worse in other European countries: Italy, for example, is under 30 millions tonnes of waste per year. Plastic wrapping need 400 years to disintegrate and we frequently find them polluting seas and rivers, so it is really to be hoped that this waste-free selling philosophy spread concretely so to reduce the amount of garbage. If more supermarket embraced this concept all the aluminium, cardboard and tetra pack wrappings would shortly disappear. At Original Unverpackt consumers have to bring their own container and fill up as much as they want. But what can we find in the first supermarket without packaging? Beside organic produce (which represents the majority of goods available) we can also find high quality conventional products like pasta, cereal, wines and beverages, products for personal hygiene and for household cleanliness. Soon the supermarket will be able to satisfy every consumer’s needs. But another revolution will take place in our fridge: having the possibility to buy exactly as much as we need we will reduce substantially food waste. OU looks like a warehouse, its sobriety is far from the colour and sound dizziness we are unfortunately used to. No doubt a lot is still to be done but this supermarket is certainly a good start towards waste-free shopping.